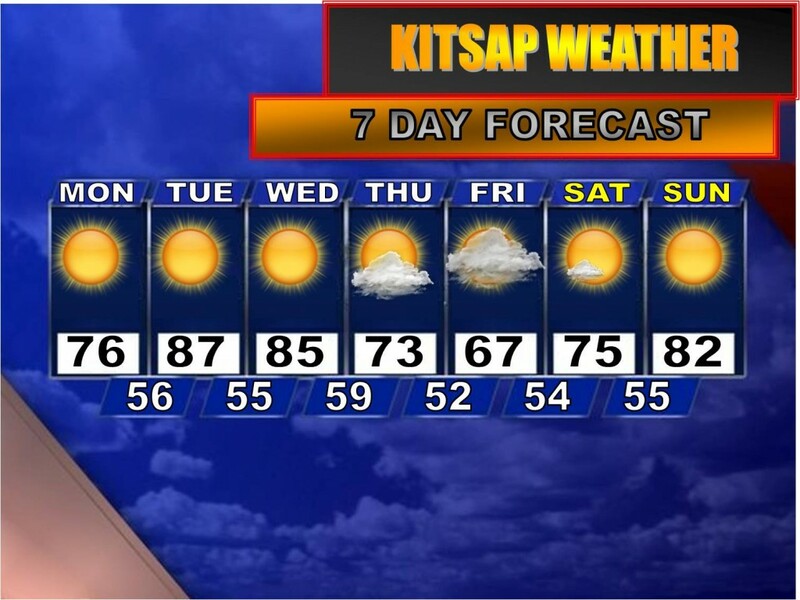 This temperature map shows low 90s for the Kitsap area on Tuesday! This ridge of high and dry pressure just doesn’t want to leave! And while it’s here, it will keep on pumping some unseasonably warm air into our region until something knocks this thing into oblivion. Today was absolute perfection in my opinion: a high of 64 with a low of 42 and sunny skies. Definitley cooler and more fall-like than I had predicted! But don’t let this weather fool you. Monday, Tuesday and Wednesday of this week will feature temperatures more suited for July than late September. Oohhh yeah…this is looking like a scorcher. What makes this round of heat different than the past few this month is it won’t last nearly as long. By Thursday and Friday a significant marine push plows through the area dropping temperatures 10-15 degrees. BUT, the upper 70s and low 80s return for next weekend. Long range models have been fairly consistent with bringing in some sharply colder air by the end of the month into October. Not so much rain, just much cooler fall-like weather.